Hendrik Coetzee was pulled from his kayak by a crocodile on the Lukuga River, according to the expedition sponsor's blog. (CNN) -- A renowned South African whitewater guide and outdoorsman was apparently pulled from his kayak by a crocodile in the Democratic Republic of Congo and is presumed dead, expedition sponsor Eddie Bauer said. 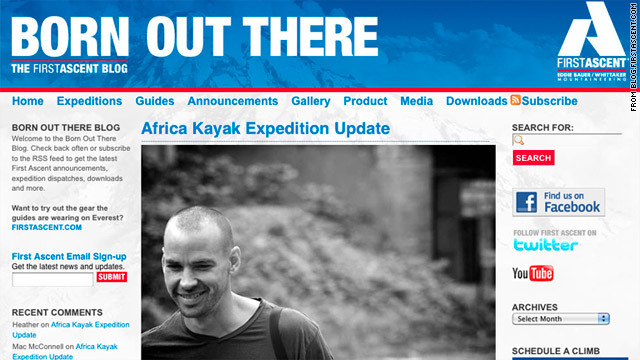 Hendrik Coetzee and two American kayakers, Ben Stookesberry and Chris Korbulic, were on the Lukuga River when the incident occurred Tuesday, the clothing and outdoor gear company said on its "Born Out There" blog. Stookesberry and Korbulic were able to paddle to safety and were assisted by the International Rescue Committee, the website said. "The mission for the Africa kayak expedition was to run and document the unexplored whitewater of the region, while focusing on the people and clean water crisis in Central Africa," Eddie Bauer said. "We are saddened by the tragic accident and express our deepest sympathies to Hendri's family and friends. We would like to thank the IRC and Solidarites International, who continue to provide assistance and support to the team." Coetzee, known as Hendri, last posted an entry on his "The Great White Explorer" blog on November 26. In it, he described the team's paddle through a challenging and beautiful stretch of river in the region. "As hard, warm drops trashed at our little selves and a pair of goats, we stood precariously on a unknown slope deep in the heart of Africa, for once my mind and heart agreed, I would never live a better day," Coetzee wrote. Stookesberry, in a dispatch published November 1 on Outside magazine's website, said team leader Coetzee offered safety advice. "Stay out of eddies ... especially the small BS ones because there are three-ton hippos that will bite you in half," Coetzee said, according to Stookesberry, an extreme kayaer. "Stay off the banks because the crocs are having a bake and might fancy you for lunch. Basically, stay close behind me and follow my lead. Any questions?" According to Outside, Coetzee gained prominence after he led the first source-to-sea expedition of the Nile River, in 2004. He later returned and soloed the infamous Murchison Falls section of the Nile in Uganda.